The K-Tuned Billet Shifter Arm is a direct replacement for the sloppy oem plastic shifter arm. This 100% billet aluminum arm uses an extremely durable delrin pivot ball with much tighter clearances than stock. We have also fitted the arm with a stiffer heat treated neutral return spring. These 3 combined parts virtually eliminate the “play” or “looseness” that is a common complaint about the stock shifter box. The result is a shifter with much improved shift accuracy and an overall “crisper feel”. This product will give the user increased confidence and reduce the chances of a dreaded “mis-shift” which can kill a motor in a matter of seconds. The oem shifter and cable system might be fine for a car going to pick up some groceries, but in a performance car this setup is definitely lacking. It is unfortunately all too common that people are missing gears with K-series transmission which can be costly. In a stock RSX or a swapped car a mis-shift from 1-2-1 or 2-3-2 usually results in a blown motor with a big ugly hole in the block. Using feedback from our family of racers, K-Tuned has come in and developed a complete shifter system to keep the gears going where they are supposed to be. The K-Tuned Shifter 5th Gear Lockout comes with our Shifter Billet Arm. This 100% billet aluminum arm uses a durable delrin pivot ball with much tighter clearances than stock. We also fitted the arm with a stiffer neutral return spring to help remove shifter “play” or “looseness” that people commonly complain about. Now for the tricky part, the 5th Gear Lockout is like a guide that was designed to keep the shifter going into the correct gear. Start with a billet template that fits over the base of the oem shifter box. On this base we designed a spring loaded pin to lock the shifter out of the 5-6-R section of the shifter. By doing this the user just needs to focus on shifting to 4 corners. However we made it with 2 settings. When setup in the release setting, 4th gear opens the shifter up for a normal shift to 5th if needed. Designed to fit all oem shifter boxes from K20A/A2/ and Z1 engines and also the EM2 Civic shifter box, this part is like an insurance policy for your engine. Street car or race car our guided 5th Gear Lockout will definitely keep your gears going in the right spot. On K-swapped cars without heater cores and top mounted shifters, most people seem to pass the shifter cables somewhere through the firewall. Sometimes the existing hole for the heater core is used and sometimes people prefer to drill a new hole slightly lower on the firewall. Either way works fine but you are always left with some ugly gaps around the cables after installation. This is exactly why we designed a special grommet that eliminates these ugly gaps and protects the cable from the sharp edges of the hole. The K-Tuned Cable Grommet has a billet frame with a 7/16” thick rubber grommet in it. Simply drill 4 holes in the corners of the frame and fasten in place with the included hardware. Great for race cars and anywhere shifter cables are passed through a firewall. Protect your shifter cables from melting and burning with K-Tuned Heat Shield Tubing. These 4 foot long and ½” ID tubes are constructed with an aluminized outer layer that is laminated to a braided fiberglass insulation that provides superior protection from radiant heat up 1400 degrees Fahrenheit. Each tube split down the middle so it can be put on the cables even when they are already installed on the vehicle. This is a very simple product that solves a simple problem. Please note that the shifter cables still need to be properly fastened away from the header and other exhaust piping. 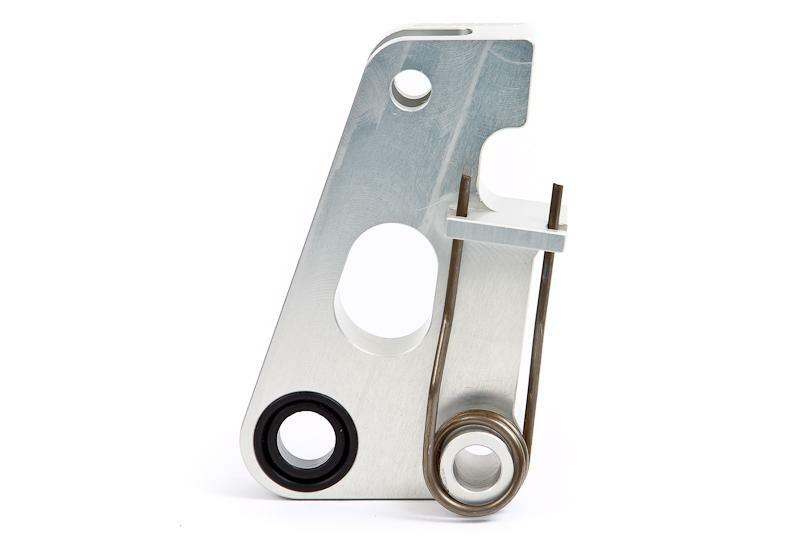 This is the cable bracket from our popular Z3 trans conversion kit. It allows you to use 03-07 Honda Accord shifter box and cables in your k-swapped cars running the 06-11 Civic Si Trans. We have taken the idea from our Race-Spec Shifter Cables and made a new cable bushing that incorporates a spherical bearing to allow greater movement while retaining the same stiff feel. The bushing is now two piece with a delrin spherical bearing. This design allows for greater movement while retaining that positive feedback. Cable bushings have a small sleeve which is uses on certain applications inside the larger bushing to accomodate more applications. OEM shifter cables are made with rubber bushings at the cable ends, which can be responsible for mushy or soft feeling gear changes. This is because the rubber material can wear out and deteriorate over time. In some cases, failure at these connections can even lead to transmission synchronizer and gear damage. We have even seen damaged shift selector parts on occasion. The unique dual O-ring design of these billet bushings allows for very slight flexibility at the joint which is critical for precise shifting. Without this movement, binding can occur. Both bushings are clear anodized to protect them from corrosion and we include all hardware needed for installation. With this kit, you’ll get 2 reusable hairpin style cotter pins for both cable end connections, and 2 bushing retaining clips.